As a provider of firearms and firearms related accessories, we take pride in offering the best prices in the Lawton area. We are dedicated to serving the needs of our customers each and every day. 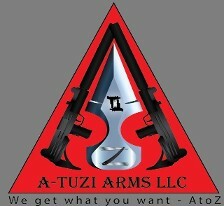 A-TUZI ARMS LLC is a small, family oriented and run, veteran owned business. We specialize in assisting firearms enthusiasts, hunters, and everyone in between in obtaining the firearms and accessories they want at the best prices available. We have been established in Lawton since February 2012. Its been a long road to get here in terms of time and effort spent building a legitimate business within the firearms industry and licensing. As an ATF licensed manufacturer and dealer, A-TUZI ARMS gets what you want.